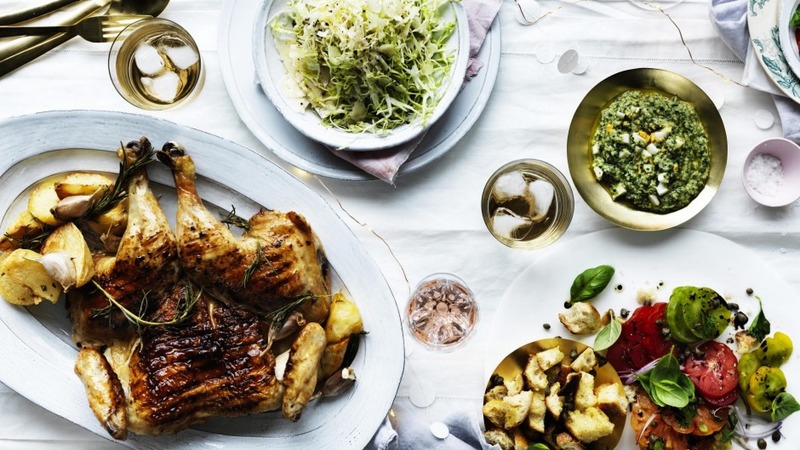 This chicken fits the bill for a minimal-fuss solution to a Christmas or other special-occasion feast centrepiece. A great salsa verde needs the best available anchovies. Ortiz is an excellent option. To marinate chicken, take birds out of the refrigerator at least an hour before cooking. Place skin-side up on a board and roll with a rolling-pin, leaning heavily to flatten. Place the chickens in a wide, deep dish. Squeeze the juice from 2 lemons over them, add half the oil, then season to taste with salt and lots of pepper (and red chilli flakes if you want). Leave out, covered, for 30-60 minutes. For the salsa verde, soak the bread with the milk in a bowl for 5 minutes, then place in a food processor along with the parsley, capers, anchovy, lemon juice and salt. Process until well combined. Gradually pour in the oil while processing to emulsify. Stir in egg and pepper. Preheat the barbecue to medium. In another bowl, squeeze the juice from the final lemon, whisk in remaining oil and season to taste, with lots of pepper. Remove chickens from the marinade, (discard marinade). Place chickens skin-side down and cover the grill. Brush the chicken with the extra lemon mixture every 5 minutes. Turn the chicken after 15 minutes and continue to baste until skin is well-browned and thigh juices run clear, about 40 to 50 minutes. Set chickens aside to rest for 10 minutes. Cut chicken into pieces and serve on a large dish with the salsa verde.